The Ondo State Governor, Mr Oluwarotimi Akeredolu, has slammed civil servants in the state, describing them as â€œselfishâ€ and â€œungratefulâ€. The governorâ€™s comment may not be unconnected to the ultimatum given by organised labour in the state, asking Akeredolu to start payment of the arrears of salaries or be ready to face industrial action. He said the present administration had been making efforts in prioritising workersâ€™ welfare since the administration came on board. 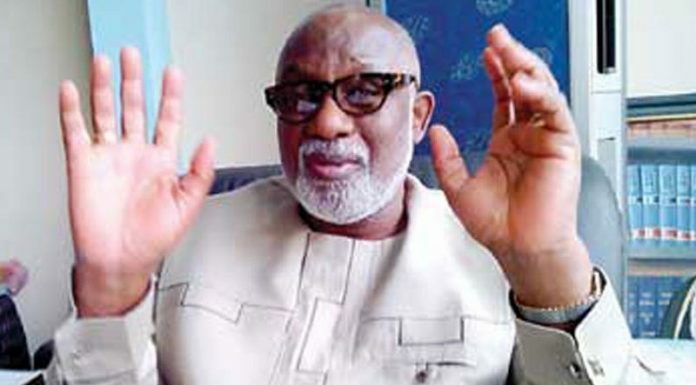 Akeredolu said his administration has been able to put in place some life changing projects in the state despite its lean resources, while the welfare of public servants have also been given its pride of place. â€œSince I came into office, I have paid your salary arrears, yet our people are both ungrateful and selfish. Since we came into office, we are not owing even a month salary. Not one single month. â€œSomebody was in office and did not pay your salaries and leave allowances, but we have paid and even promoted you and people still think we have done nothing. â€œl can tell you that I agree that we have not done nothing. I know it that that is how life is, people are both selfish and ungrateful. â€œln terms of welfare of workers in this state, we have done our best. No state has done better than us because we believe a worker deserves his pay. â€œWe pay people who are less that five per cent of the population of the state and they take 90 per cent of the income. The revenue that comes to this state 90 per cent of it goes to less than five per cent. â€œWe are up-to-date in the payment of salaries and pensions, all officers who are due for promotion have been duly served, the 2017 leave bonuses have been paid while some workers have equally enjoyed vehicles loans,â€ he said. However, Akeredolu promised to offset all outstanding arrears of workersâ€™ salaries in the state before the end of the week. â€œThe Paris Club refund due to Ondo State has been received and consultation with the leaders of the workers is ongoing on how best to balance the interest of all stakeholders in the disbursement of the fund and before the end of this week we will clear all arrears and outstanding,â€ he said. The governor disclosed that about N402.5 million would be paid to owners of structures affected by the construction of roads across the state. He said paying such money was to demonstrate the state governmentâ€™s sincere commitment to the development of the state and her people. â€œToday marks the first phase of payment on the schedule. The quantum of money we are paying today is a demonstration of our good intention to the people whose properties were affected one way or the other. â€œThe payment is to make it easy for them to relocate, acquire new properties and continue life without hardship or encumbrances,â€ he said. He stated that about N9 billion has been spent on the construction, maintenance and rehabilitation of roads statewide by his administration in the last one year as part of his governmentâ€™s resolve to fulfil its electioneering promises to the people. â€œAs I speak, the state government has intervened in the construction and rehabilitation of several roads which have had profound impact on the lives of the people. â€œThe failed sections on the Akure-Owo-Akungba road are being rehabilitated despite the fact that the road should be the responsibility of the federal government. â€œThe rehabilitation will cover 10 critical segments of the road and the quality of the job is such that the perennial failures often witnessed on the road would be consigned into history by the time the rehabilitation is over,â€ he said.